This article is mainly for those who are seeking to host own WordPress website at budget. It is possible to have faster loading website with high up-time at cheap cost as low as $2. Here is List of Cheapest Cloud Servers For Hosting WordPress in 2018-2019. We are going to discuss about virtual private servers and cloud servers. We are not discussing about shared hosting. Today, traditional virtual private servers almost same as cloud server and there is not much need for a beginner to dig deeper than we are discussing. However, to use cloud server or virtual private servers, one need to practice and self learn setup of Linux servers, basic management from command line interface. For Windows, tools are Bash for Windows or PuTTY, for Linux it is Terminal, and for MacOSX either Terminal or iTerm2. You need some FTP client program like FileZilla. Aruba Cloud, Italy provides cheapest, reliable VMWare virtualized servers at 1.5 Euro/month for 1 GB server with IPv4, IPv6. 1GB enough to run Nginx as webserver, Apache2 will nicely work for low traffic sites. VPSDime provides 6GB RAM OpenVZ servers at $7/month for with IPv4 only. 6GB needed for medium traffic website to run Apache2. If you have site over 20,000 hits per month, you probably need 6GB one. We discussed about commonly known other web hosts like DigitalOcean, Linode etc. Rackspace, IBM/Softlayer are costly options and suitable for websites which need higher bandwidth, paid server management etc. With common sites, you’ll not feel difference among the webhosts for Cloud Servers we mentioned. You can use Hurricane Electric free DNS or Rage4 DNS. Dyn DNS is costly DNS. You have to use some CDN. We listed cheap CDNs in other articles. You need a cloud transactional email service to make email from domain name easy. SendGrid used to provide forever free service with enough emails per month for normal websites. There are WordPress plugins to integrate them without need to learn programming. Your cost essentially at minimum that of the cloud server. What Cloud Servers For Hosting WordPress Differs With Dedicated Server? Self managing dedicated server need experience and cost will go up to $35/month. It is practical for dedicated server to have a live clone on cloud server. Dedicated server in unmanaged condition can fail out of hackers odd works. It is not exactly easy to master the works. Servers on SSH are same but dedicated servers has more difficult matters as it is a real physical computer. Performance of dedicated server will be as per the quality of hardware and networking. It is not exactly possible to give assurance of uniform performance of cloud server on all types of virtualization. 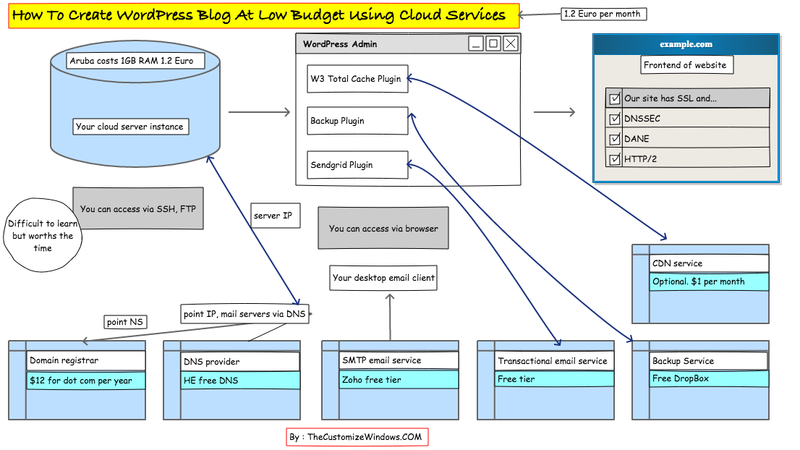 How to Learn Using Cloud Servers For Hosting WordPress? There are many guides with steps of commands to run over SSH including the webhosts, our site and official WordPress documentation. Installing Apache2, PHP, MySQL and then installing WordPress is very easy. It will initially appear difficult but after few times practice, you’ll get used. We have a guide on getting started with servers for the newbies. We have guide to install WordPress on Ubuntu 16.04 LTS, which is listed on official WordPress documentation but outdated as Ubuntu 18.04 LTS is replacing. At this moment, we do not have detailed guide on installing WordPress on Ubuntu 18.04 LTS. You can follow some standard website. As for security, we recommend to install Fail2Ban to ensure basic security. We suggest to install Apache2 over Nginx as Nginx if throws errors that needs experience to handle. Apache2 is robust, but you need to supply huge RAM. This Article Has Been Shared 7774 Times! Cite this article as: Abhishek Ghosh, "Cheapest Cloud Servers For Hosting WordPress in 2018-2019," in The Customize Windows, May 9, 2018, April 23, 2019, https://thecustomizewindows.com/2018/05/cheapest-cloud-servers-for-hosting-wordpress-in-2018-2019/.